These caprese skewers combine tomatoes with basil, mozzarella, olive oil and balsamic for an appetizer that’s both easy and impressive! 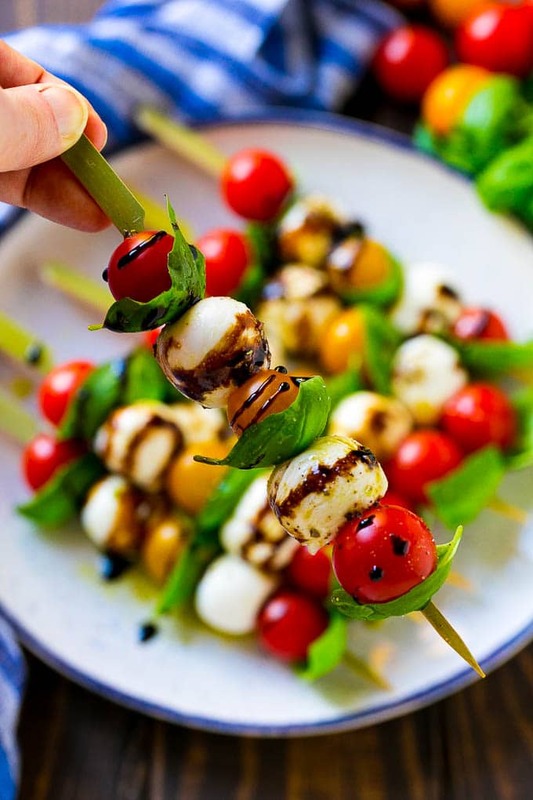 I serve these caprese kabobs at all my parties, everyone loves this classic flavor combination and it’s even more fun to eat it off a stick! Sometimes when it comes to appetizers, simple and easy is the best way to go. 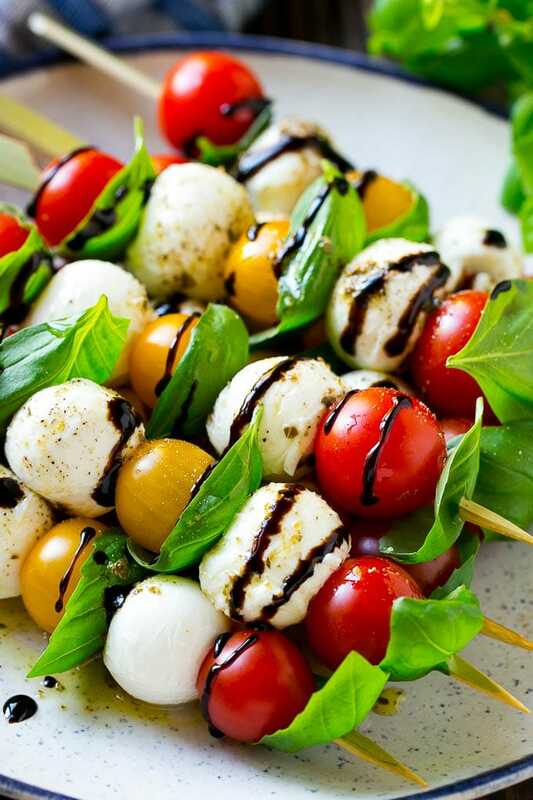 These pretty little caprese skewers are light, fresh and absolutely perfect for entertaining. It’s an elegant way to do caprese salad that will earn you rave reviews! 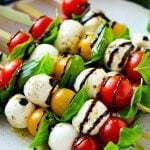 To make these salad kabobs, you’ll need cherry tomatoes (I used both red and yellow for color contrast), small mozzarella balls, basil leaves, olive oil, Italian seasoning and balsamic glaze. 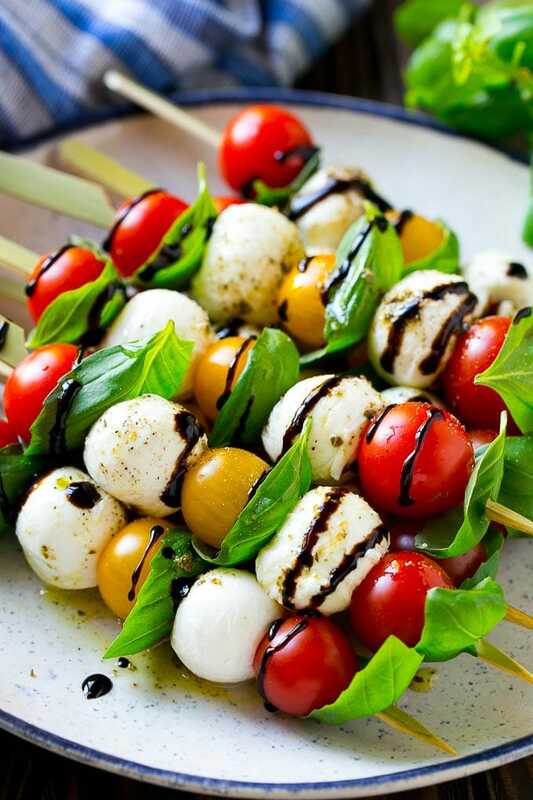 The tomatoes, mozzarella and basil are threaded onto skewers and then drizzled with seasoned olive oil and balsamic glaze. From there, simply serve and enjoy! You’ll want to look for a bunch of basil with smaller leaves for this recipe. I actually used that “living basil” that comes with the dirt still attached because the leaves were small and tender. Balsamic glaze is basically balsamic vinegar that’s been reduced until it’s thick and syrupy. It’s sweeter than balsamic vinegar and it clings to the skewers much better than standard balsamic vinegar would. You can find balsamic glaze (also called balsamic reduction) at most grocery stores near the regular salad vinegar. You can thread the tomatoes, basil and mozzarella onto skewers about one hour before you plan to serve them; simply cover with plastic wrap and refrigerate. The olive oil and balsamic glaze should be added right before serving. While many tomato recipes are best during the summer when tomatoes are in season, these caprese kabobs are actually great year round, since cherry tomatoes tend to be naturally sweeter than other tomato varieties. It’s a party snack that’s welcomed for any occasion! Start with 12 6-inch skewers. Thread the tomatoes, basil and mozzarella onto the skewers in the pattern shown in the images above. In a small bowl, mix together the olive oil, Italian seasoning and salt and pepper to taste. Arrange the skewers on a plate and drizzle with the olive oil mixture. Place the balsamic glaze in a small plastic bag with one corner snipped off. Drizzle the balsamic over the skewers, then serve. I’ve been making these now all the time! I got this amazing thick Balsamic vinegar that I use and they are sooo good! You can but the basil leaves could potentially wilt in the fridge! Those skewers are perfect for parties this season! I really like serving dishes that the guests won’t have a difficult time eating. It’s also easy for me to put together so it’s a win-win! What a fun skewer! These would be fun to put out on the table for Christmas Eve! Those are really awesome, I am loving those skewers and they’re brilliant, an even better idea than to serve them on a plate. It’s clean and the guests can easily enjoy them! It’s a lovely addition to the table this Christmas, it’s perfect for gatherings and it’s easy to make. I love the simplicity, it doesn’t take much time to put together! This looks so delish! Such a perfect appetizer for our holiday parties! I love all the ingredients in this recipe! I agree that when it comes to appetizers, the simpler the better. This one is a go-to for all my get togethers. These skewers look delicious. I think they would be a big hit at our next friend get together. If I can wait that long to make them. I love anything caprese so this would be right up my alley. I need to make these soon. These skewers look so delicious and easy to make. I will have to get the ingredients I need to make some for my holiday party. These look like such an easy and delicious appetizer! Yum! I love quick stuff like this that I can put together quickly. Perfect for last minute entertaining! Although I’m not a tomato-lover, I’d serve these as an appetizer. Kids would love these too! I love that this appetizer is so easy to make! The colors are so festive too – red, white and green! So very Christmas! I will make this to add to our Christmas day feast with my family. Definitely an easy appetizer but with a healthy kick all at once. They’re so elegant looking! Perfect for the holidays. Ooh, having some delicious caprese skewers before dinner could be fun. These would be such great appetizers! Those sound so good! I love how healthy they are, and I especially love what a great visual statement they make. They’re the perfect appetizer! My mom used to make something very similar to these and we DEVOURED them. I can’t wait to make these.